The Machu Picchu route navigates through thrilling ecosystems, altitudes and climatic zones. Therefore, it is important to pay attention to a lot of factors in order to make the trip worthwhile. Starting from acclimatization to planning the Inca Trail hike, exploring the Incan ruins and experiencing the energy vortex, it is advisable to follow travel tips and advice from those who have already visited the Lost City of the Incas. It is best to decide your destination city beforehand. Most visitors start from Lima, the capital of Peru and take the bus or fly to Cuzco. If you take the flight, it is advisable to leave early in the morning as clouds in the Andes Mountains may cause flight delays later in the day. Cuzco is an interesting tourist destination and it is worth staying a night there. If you reach Cuzco in the morning, there is a whole day to explore the city before you take the train to Machu Picchu the next day. 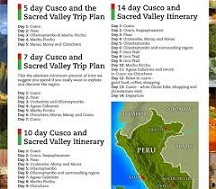 You can use the Perurail website to book train tickets from Cusco to Machu Picchu. There are three trains departing to Machu Picchu namely, the luxurious Hiram Bingham, the next expensive Vistadome and the least expensive Backpackers. AguasCalientas is the destination train station, and you can take a bus from there. Machu Picchu’s high altitude may cause altitude sickness for those who are prone to the condition. Hence, it is advisable to start acclimatizing about 600 meters of altitude per day. You can begin at Cusco at 11,000 feet, or better still at Sacred Valley at 9,000 feet. It is advisable to arrive at these altitudes about three days earlier than the scheduled visit to Machu Picchu. Coco-leaf tea, a Peruvian beverage, is a popular natural remedy for altitude sickness. Alternatively, you may use over-the-counter medications, with proper knowledge of the side effects. As dehydration is the prime cause for the problem, it is important to take enough fluids. It is also advisable to avoid alcohol, fatty foods, caffeine and smoking. Hiking through the Inca Trail is only for those who are absolutely fit. You must acclimatize for at least seven days before planning to hike. The four-day trek through the mountains is not an easy task. Once you have decided to take the trail, it is important to wear sturdy hiking boots and pack the necessary hiking gear. The trail passes through some of the most beautiful landscapes and you can get a glimpse of the Inca ruins spread along. Visitors are required to obtain a permit in advance to undertake the trek. It is nice to spend two days at Machu Picchu as there are other interesting activities, such as hiking the Wayna Picchu, apart from exploring the ruins. The sunrise is a must-see at Machu Picchu, so you can take the first buses that leave around 5-5:30 am and reach Machu Picchu by 7:00 am. Though the sun rises at about 5:30 am, it comes out from behind the mountains only at about 7:00 am, rendering a spectacular view, as it unveils Machu Picchu gradually. It is a memorable part of the Machu Picchu trip.